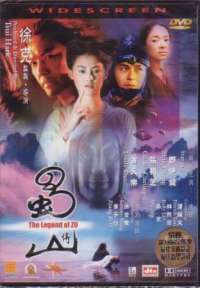 Tsui Hark applies his tremendous imagination power to produce this movie containing lots of computerized special effects to the extent that has never been seen before in the history of the Hong Kong film industry. Over the past several years I've seen some of the big computer graphic Hong Kong films, like A Man Called Hero, Stormriders and The Duel all of which were made by Andrew Lau. With maybe the exception of the latter I like them all. So with a lot of excitement with The Legend Of Zu being handled by the equally legendary Tsui Hark I bought this DVD very shortly after its release date. Somewhere between purchase and receiving the delivery my excitement must have faded, maybe due to reports that the film was a bit of a mess, as only now, about 5 or 6 years later have I finally got around to watching the film. Fortunately time had also faded all expectations so I did not go into the viewing with high hopes. The synopsis above does not begin to detail the complexities of the plot in The Legend Of Zu. Many characters appear throughout the film, some as reincarnations of previous characters and others as the same character reborn, so any viewer can be forgiven for becoming a little confused at points. However, despite the complexities in the characters, when you look at the story from afar it is all simply about a bad guy who wants to destroy all the 'good guy' martial arts schools. That sort of plot has been used, reused and rehashed in Hong Kong cinema more times than you can possibly count, but here to give it a gleam of a little bit of originality and confusion, the story has been adapted to a mystical, supernatural environment. Taking the film to this supernatural environment, while giving the prospect and possibility of fantastic visuals, reduces the good-old-fashioned martial arts fighting. All fight scenes in the film are handled supernaturally with the characters attacking with fireballs from their palms and the like. Yeah, it does look good but is not nearly as entertaining as seeing two characters thump the living hell out of each other! Watching the fantasy fight scenes and general backdrops highlighted an issue that's arisen from me waiting about 5 years to watch the film. That issue is that some of the CG work now looks rather dated. Being so used to state-of-the-art Hollywood CG where you can hardly tell that it is CG, the CG in The Legend Of Zu looks like CG. At times it doesn't blend overly well with the rest of the picture and does look like it has just been dropped on top of the film print. That is only at times, once I got used to it more it is less noticeable. One very attractive feature of the film is its cast list. 'All star' is a phrase that could quite aptly apply here. Ekin Cheng, Cecilia Cheung, Louis Koo, Patrick Tam, Sammo Hung and Zhang Ziyi being the biggest names, it is certainly quite impressive. Having that many big names it is inevitable that a few are reduced to little more than a cameo performance, with their names just there to increase the cast list's pulling power. For the over-the-top type of film that The Legend Of Zu is, all the performances are decent enough. I wasn't left in awe with anyone but neither was I left embarrassed by what I saw. A similar feeling arises when thinking about the film as a whole. It was simply nothing more than ok, neither excelling nor failing. The visuals help distract from the lack of depth to both the story and characters. While playing their parts well enough to convincingly move the plot along, the actors and actresses do not build up any feeling in their characters to give the viewer someone to sympathise or empathise towards. All in, the film fells rather hollow. I watched the film in DTS mode and it rocked! The surrounds were used extensively and rather effectively. There could have been more zooming around the surrounds to the rears but what there was, was good. Bass levels thumped and all effects sounded crisp and clear. The subtitles were not quite so good. All the text that was on screen was largely free from spelling and grammar errors, as far as I can remember, but the major, major flaw in the subtitles was that they did not subtitle all the speech. It isn't even just a few sentences here and there that were missing, it will fairly large chunks at far too frequent intervals. This quite possibly was a large contributor to me finding the film a little confusing at times. Back when this film was released, it was a fairly major release of its time. 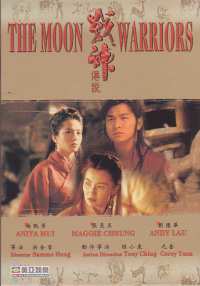 One of the early anamorphic widescreen DVDs of a Hong Kong film to hit the shelves. Fortunately they seemed to do well from the word go. Detail levels are high, colours are crisp and vibrant, there is little in the way of dirt or blemishes on the film print and grain levels are minimal. A very nice looking transfer. There are a reasonable number of extras here. First off there are trailers for two other films - Born Wild and Love On A Diet - then in the main extras section there is the following: Film synopsis, info on the film's characters, cast and crew information and filmographies, the film's trailer, production notes and a 19 minute "Making Of". This "Making Of" largely focuses on the CG aspect of the film and features interview snippets with cast and crew. It is subtitled in both English and Chinese. The DVDs menus are available in either English or Chinese too. If you like your CG fantasy films, then this one may be for you as it is not bad, just that it is not that great either. I didn't find anything in this film that grabbed me and made me want to see more, there was nothing enticing about it and there was nothing here that hadn't seen done better elsewhere, albeit in different packaging.